Devon Kennard (55) rips the ball out of Bills tight end Charles Clay's hands to make one of the most impressive interceptions you will see all season. The New York Giants will likely be without two of their best starting defensive players in Week 5 against the San Francisco 49ers. Both linebacker Devon Kennard and Robert Ayers were absent from practice again on Thursday, and it seems unlikely that either player will suit up on Sunday night. 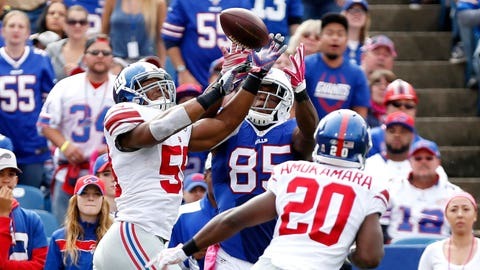 Kennard injured his hamstring during the Giants' Week 4 win over the Buffalo Bills later in the game after he made this ridiculous interception. Kennard, in his second season in the NFL, has been arguably the Giants' best defensive player through four weeks. He can do it all — he's an excellent blitzer, run defender and he makes plays in the passing game. Ayers generated the most pressure of any Giants defender in 2014, but he has been battling a hamstring injury since the start of the season. Ayers was forced to miss last week's game, and this week seems doubtful as well. LB Devon Kennard (hamstring) is still not practicing today. Looks like he'll be a longshot for Sunday night. DE Robert Ayers (hamstring) was also not scheduled to practice, making him a longshot for Sunday, too.